525 W. Town Center Blvd. At All About Eyes, we make it easy and affordable to find a new pair of glasses and get a new prescription in Champaign, IL. We combine experienced optometrists with a wide range of eye care products to ensure you find what meets your specific needs. Come to us when you need a convenient way to update your glasses. Click the button below to set up an exam today using our helpful online scheduler. Or call 217-531-5393 to schedule an appointment at our office in Champaign, IL. Dr. Jeffrey Lewis has been living in Champaign, IL for a little over 4 years. He spent the majority of his life on the east coast (NJ,VA and MD). For college he moved to the Midwest, where he attended the University of Wisconsin-Madison. As a Badger he majored in psychology, zoology, and neuroscience. During an internship at a private optometric practice, in Madison, he found his passion for Optometry and decided to pursue his Doctorate of Optometry. Having greatly enjoyed his experience in the Midwest, he chose to study at the Illinois College of Optometry, in Chicago. Dr. Lewis joined the All About Eyes team in 2012 upon graduating from ICO. In his spare time, he enjoys traveling, athletics, and running his entertainment company. 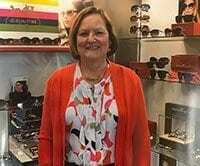 Dr. Julie Quivey, a Paxton, Illinois native, attended Southern Illinois University­ Carbondale and Illinois College of Optometry in Chicago, graduating with honors in 1985. She has practiced in Champaign, IL since graduating from ICO. Having worked in private and corporate practice, she enjoys the vast opportunities to find solutions to various eye problems. Dr. Quivey has been a member of a national advisory and peer review panel and a clinical investigator for contact lens companies. She is a member of the American Optometric Association and the Illinois Optometric Association. In her free time, Dr. Quivey enjoys traveling, outdoor activities, gardening, and watching all types of sports. She is an avid Cubs, Bears, and Illini fan. Dr. Quivey lives in the Mahomet, ll., area with her husband Herb and their three cats, Jack, Jill, and Cali. Looking for a truly unique set of glasses? We carry the latest creations from a variety of brands, so you can find the pair that speaks to who you really are. Our helpful staff can answer all of your questions as you search for the right set of frames. We’ll fit the frames in our store and then have your lenses crafted in our advanced laboratory. All About Eyes makes it easy to get an eye exam. Our evening and weekend hours allow anyone to have their eyes checked at a convenient time. Our licensed optometrists will work closely with you to determine what products will meet your specific needs. We provide the same comprehensive exam you would receive at any doctor’s office.